10 feet to 7/16 inch approx. The plan corresponds to the ground-floor plan, 2, in every respect. On the elevation to the park the Venetian windows in the intermediate pavilions are repeated at first-floor level and little variety appears to be offered in the central pavilion. This has an applied portico with four giant pilasters, each 4 feet wide (and so presumably 40 feet high), and single recessed bays each side. 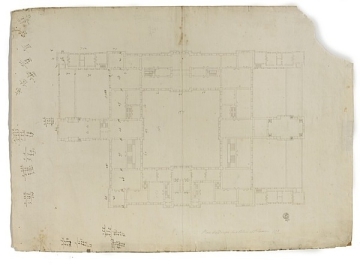 Like the ground-floor plan, this scheme ignores Inigo Jones's Queen's Chapel, and proposes a new chapel on the eastern side of the east wing on the main cross axis.